An excellent holiday and would definatly return. This is a 5 star hotel, with grounds, facilities, staff & service to match. I emailed 4 weeks prior with a room request of 2 adjacent rooms in cluster 7. I had read this was a quiet location which is our preference. Guest services replied they could not guarantee this, but would try - fair enough. We arrived on the Fri of a local holiday, so the hotel was full & they could not meet the request, but offered a 1 bed suite for the 1st night & a move next morning to adjacent rooms in cluster 7, which we accepted. We were told that if we preferred the suite we could have it for the week. It was beautiful, but unfortunately the sofa-bed was not comfy enough for the 3rd adult (probably fine for a child) & we had a preference for a 2nd bathroom, even though the suite bathroom was huge. The staff moved us the following morning to 7124 & 7125, both excellent rooms, overlooking the lagoon pool. It wasn't the inconvenience one would assume, I didn't move from my sun-bed & it took 20 min of DH's time to be with the staff to check the right bags went into the right rooms & obtain new keys. If we return as a couple we would love to stay in a suite, lots of space, peaceful location, 2 balconies, 1 massive with a full patio set plus outstanding views. We stayed on a B & B basis, breakfast was excellent. I'm sure if you were of a mind you could eat enough to keep you going till dinner. They do offer an AI programme but we wished to eat out of an evening. We had lunch most days served to our sunbeds round the lagoon, by the more than willing staff for example capress salad, chicken wrap & chips, portion of chips, bread basket, large beer & large water or 7up cost between LE170 & LE200 which seemed OK value for 3 adults. We had 2 meals in El Sayadin the fish restaurant, our meal on the 1st evening & a lunch. This has to be the best setting in El Gouna for lunch due to the views. Fish soup, 7 mixed meze, breads, a beer, 7up, water, 3 desserts & a coffee was LE350. A basic evening meal (not fish, please not this is sold by weight) for three was approx LE600. We also ate in the Thai which is prettily located by the Oasis Pool at night, this was great food & cost approx LE500. All food & drink we consumed was enjoyable & good quality. Never made it to El Limone the Italian. Being new to El Gouna we weren't quite sure where we were located in the resort. We seemed to be on the outskirts, however the local transport system of tuk tuk's & shuttle buses are very efficient. We could be in Downtown in 5 mins or the Marina in 10 mins. Downtown & the Marina are the 2 main hubs for restaurants, bars & shopping. Maybe we could have walked to downtown in 15 min, as while travelling we passed many who were walking there. But the fare in the little vehicles is the equivalent of 50p per person for a single journey & they are fun to ride so we took advantage of them. The Movenpick staff were excellent, from the cleaners to those working the restaurants, there were people raking out the edge of the lagoon (lots of jellyfish to clear up), checking the pools & tidying the gardens. Our rooms were on the edge of the hotel, but if walking to reception & a member of staff was on one of the golf buggies & saw you, they would always stop, ask where you were going & offer a lift. We did tip, little & often, small denomination Egyptian notes & we used up some dollar bills we had to tip the room boys at the end of the week, as they did a great job. Replenished the toiletries, loo rolls, change the towels, refilled things we used from the mini-bar etc. If we signed for food/drink to be charged we made it up to the next round number. No need to wander around with shed loads of cash, also the staff whilst grateful were not looking for tips. In terms of entertainment, not sure what was going on of an evening, there was a small stage though, but we went out by 8pm. During the day there was the normal organised activities taking place at the Oasis Pool, but the staff did come round the Lagoon pool to let guests know what was going on. The dive school is located under El Sayadin. I thought it was a company called Dive Tribe, but they seem to have been taken over by Emperor. We did an excellent dolphin spotting boat trip with them & DD did a 1 day refresher dive course which good, so would recommend them based on these experiences. The Orange Concept also work out of this hotel & offer various water based activities but we didn't have time to try them. We thought about it but struggled to find anything we disliked about this hotel. It wouldn't suit people who want small & intimate. I imagine the main restaurant at night could be a bit frantic, but then that's buffets for you & only to be expected. But the overall level of service on offer is something that a lot of hotels are still striving to achieve. The hotel attracts families with children, probably due to the multiple pools, large rooms, playground & AI. We would consider a returning. The 5 hour Thomas Cook flight is a serious downside, but you do forget it once you are there, we probably need to accept that we should go for extra leg room seats on this route. Well, the food was awful and bland limited choice, thank goodness for chips!! Paid extra couple of nights in restaurant in town just to get some taste. Definitely not 5 star!! Was shocked when I realised was meant to be 5 star have stayed in 2 star with better food entertainment and facilities before. The quality of the room was poor considering was meant to be executive double! The staff in general are very friendly and the only place I found edible cheap food was at the lagoon bar definitely best pool and site for relaxing and snacks. Would I recommend? in all good conscience I couldn’t and even though liked the people would look for different hotel with better facilities. I did have a great massage though well worth the extra I paid. 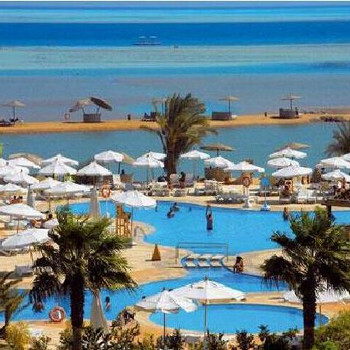 From their website the Movenpick El Gouna looks idyllic. We could'nt wait to escape the European freeze and visit what appeared to be paradise. The reality was very different. We spend our week in what is a building site. Our room was situated next to the reconstruction site, and there was drilling and hammering all day long. It was a nightmare. One our second morning we woke up with stomach pains and spent the next five days running to the toilet.We were not the only guests to have contracted food poisioning, our neighbours and many other visitors experienced the same problem. We had been dining in the main buffet restaurant which is huge. Salads, vegetables and meats are on display for hours. Even the staff at this restaurant complained of the same stomach bug we had picked up, but continued to work despite this. The Movenpick is situated in a beautiful location with a glorious stretch of beach. However there was a chilly wind that blew on most days, and we needed to wrap up at night. Fortunately we had brought our fleeces. The Egyptian staff could not be nicer or more helpful. They work for small wages so do tip them. The Swiss and German staff in contrast were very frosty and we received this glacial response when we complained about the building work going on all around us, the drilling and the tractors passing our door. 'It's part of our refurbishment' was the rebuff we received. We could not believe that we had paid in the region of 250 Euros per day to stay in what was a building site. I think that the Movenpick needs to be more honest in their advertising and let visitors know the reality of what they will encounter when they arrive in El Gouna. The worst part was we were lying in bed one night watgching t.v. when my wife felt sometihng on her hand, it was a huge cockroach crawling up her arm. She was horrified!. We were staying in a so called 'luxury' suite. If their de luxe suite ave cockroaches I dread to think what the standard rooms are like. We would never stay at a Movenpick resort again. Our German neighoburs told us that the boss of Movenpick make a substantial donation to the German government who brought in legislation for little or no VAT on hotels. Plus they base themselves in Switzerland to avoid paying any taxes. Typical of this mean spirited company. Personally we found the hotel too big for us although it was absolutely gorgeous. Set in the most fantastic suroundings,the majority of the staff were brilliant. Gallery bar staff to be recommended,also staff in Plavarion for breakfast. We sat first night in fun pub totally ignored for 10 mins which is how we found gallery bar,and drank there for rest of our stay. We find this to be an excellent hotel, so much so we have stayed there 3 times now. Location is excellent, nice stretch of beach to walk along, plenty of room around the pools - no fighting for sunbeds, mattress, towels & brolly provided. You can stroll to downtown area's bars & restaurants in around 10 mins & a 4 min taxi ride will get you to Abu Tig marina, more restaurants & a very pleasant area to while away the evening. Although the breakfasts were great in the hotel we found the evening food bland & unappealing so we ate out every night - very cheaply. The hotel staff are very helpful, can't do enough for you & love to practise their English if given the opportunity. The entertainment as in most hotels is mediocre at best, belly dancing, the whirling dervish & a third rate singer! Stayed at the Movenpick for two weeks. Very nice hotel. A large complex which can involve a fair bit of walking. Went in June so swimming pool/sea a shade on the nippy side until you had been in for a while. I have to say that if your looking for pure relaxation then this is a good place for just that. Taxis, tuk tuk's, cheap to get about the place in. Marina very nice, as was down town. There is a small English pub called Smugglers I think in the marina (abu tig). No complaints, other than on the Cairo trip by coach was not booked into the promised hotel but a much lower class one. A little on the grubby side. (Thomson's I believe we booked through). Watch your seats when you get back on the coach after visiting the market in Cairo. Some of our dear European friends will move your stuff off your seat and pinch it! Nice trip to do is the one to the island off the coast of Hurghadha. All in all, a very nice holiday. The waiters/hotel staff are polite and very friendly. One of the best hotels we have been in Egypt!